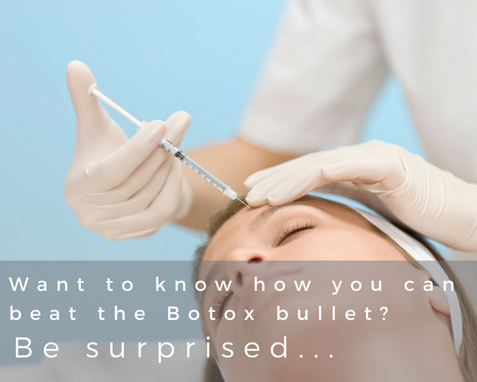 Want to know how to dodge the Botox bullet? Home/Blog/Want to know how to dodge the Botox bullet? One of the most common areas for Botox is the “crow’s feet” or “laughter lines” around the eye area. This area can age up to 10 years faster than the rest of you! The area around your eyes is tissue thin with little fatty tissue and limited oil glands so our natural plumping is already under pressure. Plus squinting and constant movement speeds up the process of developing lines and wrinkles. What if you could future proof the delicate eye area from accelerated damage and ageing? Botox is both expensive and continuous. But there are effective, less invasive and more cost effective alternatives. By using a well formulated eye cream containing a combination of ceramides, Retinol, Vitamin C, and Vitamin B3. Plus look for Hyaluronic Acid and Shea Butter. Oh and Caffeine! (Yes, it’s great for puffiness). These ingredients nourish, repair and restore your delicate eye area. While all these are ideal ingredients there is hardly one-size-fits-all. Eye creams are like your face serums with carefully chosen ingredients to address a variety of concerns. Your normal moisturisers are not suitable for the eye area as they can be more active and therefore a little harsh on this area. And when combined with some effective clinic treatments you can have healthy, younger looking skin that doesn’t require expensive and invasive injectables. Are your dark circles brownish? More than likely an overproduction of melanin. Or, purplish? These are blood vessels through your skin. Often genetic dark circles can also come from sun damage, age and fatigue. Vitamin C promotes collagen production and helps thicken the skin concealing dark circles. Difficult to treat, it takes time to reduce the dark circles therefore consistency is the key. Puffiness is a build-up of fluid and blood under the eyes. Pop your eye cream in the fridge and apply at night and let the magic happen! Or look for an Eye Cream with Caffeine included and ideally use at night. Moisture based eye creams are great for day use and can act as barrier against drying matte make up and powders. If you experience scaliness around the eye area, a moisturising eye cream is an ideal way to treat this condition. Use in the morning before your makeup. Sun damage, HEV exposure from computer screens and smart phones, squinting into the sun on our way home to even how your mum looked at 25 affects those smile lines. Collagen boosting ingredients like peptides and the princess of wrinkle smoothing retinol will help reduce the look of fine lines around the eye area. Combine with treatments such as about IPL (Intense Pulsed Light), microneedling or vitamin infusion treatments and you have both a cost and results effective alternative to Botox. IPL stimulates collagen production by warming the skin leaving it smoother and younger looking. Microneedling creates a wound healing response which stimulates collagen production. Vitamin infusion treatments use cell communicating ingredients such as Vitamin A and C to “re-educate” your skin cells to behave “younger”. Commitment and consistency are the keys to amazing results – 4 to 6 treatments will last around four to eight months. Eye creams like sunscreen will help reduce the effects of premature ageing. Also it’s essential that your eye area is properly cleansed with the right eye cleanser, (not your face cleanser as once again, too harsh on this delicate area).